If you are new to our parish and would like to register with us, click the button below. If you are an existing member, but would like to update your contact information, you can complete the same form. Since the parish was established in 1988, we have grown significantly. Through the generosity of Time, Talent and Treasure of our parishioners, our beautiful new Church was dedicated on December 12, 2009. In fact, we now have more than 2,500 registered families and more than 50 ministries, programs and organizations. A true testament to the activity of our parish is reflected in the 700 students we have in our Religious Education programs and our extremely active Life Teen and middle school youth group. Above all else, we are a place of worship, reflecting the ideals of sacrifice and service. Our Adoration Chapel is open daily. Enhanced by a strong music program, parishioners enjoy and participate in several choirs including our much-liked Life Teen band. 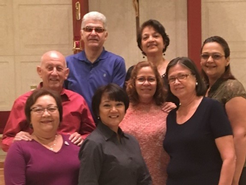 Our liturgical ministries are also thriving - many parishioners serve as Extraordinary Ministers of Holy Communion, Lectors, Greeters, Altar Servers and Ushers. Our growing community also holds a Spanish Mass every Saturday for our Hispanic community and a Tagalog Mass one Sunday a month. 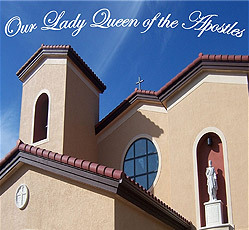 At Our Lady Queen of the Apostles you will find many opportunities to become an active member and share your time and talents. Our church will be here serving our parishioners and community for generations to come. "Virgen y Madre María, ayúdanos a resplandecer en el testimonio de la comunión, del servicio, de la fe ardiente y generosa, de la justicia y el amor a los pobres, para que la alegría del Evangelio llegue hasta los confines de la tierra y ninguna periferia se prive de su luz." Papa Francisco.